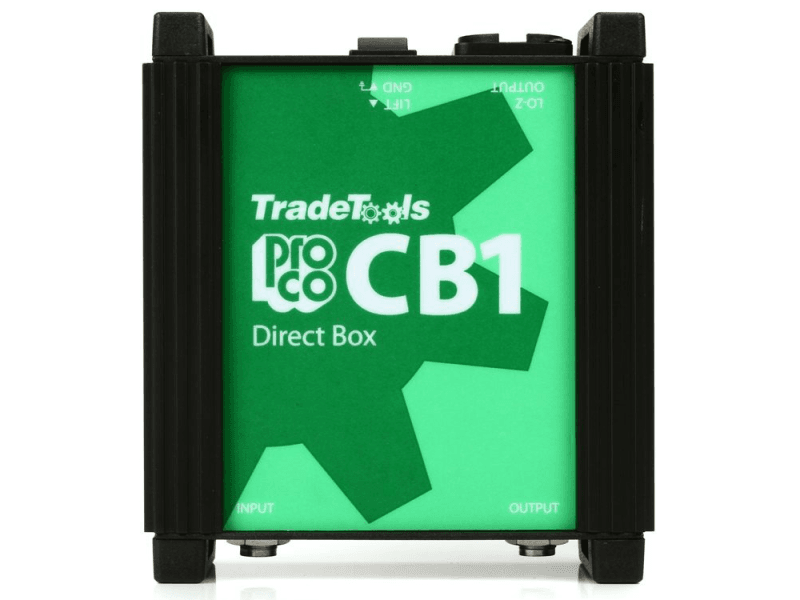 The ProCo TradeTools CB1 is a simple passive direct box that offers clean, reliable performance with nearly any unbalanced signal source, including electric bass, acoustic guitar pickups, keyboards, drum machines and mixer outputs. Using the CB1 is a convenient, low-cost alternative to mic’ing speakers. It reduces distortion and coloration and eliminates “bleed” and leakage from other instruments. The signal delivered to the P.A. or studio mixer is crisp, clean and full - a vital element in retaining the awesome bass and brilliant sound of digital instruments such as synthesizers and digital-sampling drum machines. The CB1 shares the heavy-duty “Uni-box” construction with ProCo’s premium TradeTools DB1 Direct Box. The rugged 16-gauge steel and aluminum box is finished in black with a bold blue Lexan® overlay emblazoned with high-visibility control and connector identification graphics. The uniquely slotted side channels allow for stacking on top or strapping side-to-side of virtually any number of ProCo TradeTools devices using the Uni-box construction.